Jennifer Rosenberg is a historian, history fact-checker, and freelance writer who writes about 20th-century history topics. World War II, which lasted from 1939 to 1945, was a war fought primarily between the Axis Powers (Nazi Germany, Italy, and Japan) and the Allies (France, the United Kingdom, the Soviet Union, and the United States). Although World War II was started by Nazi Germany in their attempt to conquer Europe,it turned into the largest and the bloodiest war in world history, responsible for the deaths of an estimated 40 to 70 million people, many of whom were civilians. World War II included the attempted genocide of the Jewish people during the Holocaust and the first use of an atomic weapon during a war. After the devastation and destruction caused by World War I, the world was tired of war and was willing to do almost anything to prevent another from starting. Thus, when Nazi Germany annexed Austria (called the Anschluss) in March 1938, the world did not react. When Nazi leader Adolf Hitler demanded the Sudeten area of Czechoslovakia in September 1938, the world powers handed it to him. Confident that these appeasements had averted a total war from occurring, British Prime Minister Neville Chamberlain stated, "I believe it is peace in our time." Hitler, on the other hand, had different plans. Completely disregarding the Versailles Treaty, Hitler was ramping up for war. In preparation for an attack on Poland, Nazi Germany made a deal with the Soviet Union on August 23, 1939, called the Nazi-Soviet Non-Aggression Pact. In exchange for land, the Soviet Union agreed to not attack Germany. Germany was ready for war. At 4:45 a.m. on September 1, 1939, Germany attacked Poland. Hitler sent in 1,300 planes of his Luftwaffe (German air force) as well as more than 2,000 tanks and 1.5 million well-trained, ground troops. The Polish military, on the other hand, consisted mostly of foot soldiers with old weapons (even some using lances) and cavalry. Needless to say, the odds were not in Poland’s favor. Great Britain and France, who had treaties with Poland, both declared war on Germany two days later, on September 3, 1939. However, these countries could not gather troops and equipment fast enough to help save Poland. After Germany had waged a successful attack on Poland from the west, the Soviets invaded Poland from the east on September 17, per the pact they had with Germany. On September 27, 1939, Poland surrendered. On April 9, 1940, the quiet interlude of the war ended as Germany invaded Denmark and Norway. Having met very little resistance, the Germans were soon able to launch Case Yellow (Fall Gelb), an offensive against France and the Low Countries. On May 10, 1940, Nazi Germany invaded Luxembourg, Belgium, and the Netherlands. The Germans were heading through Belgium to enter France, bypassing France’s defenses along the Maginot Line. The Allies were completely unprepared to defend France from a northern attack. The French and British armies, along with the rest of Europe, were quickly overpowered by Germany’s new, swift blitzkrieg (“lightning war”) tactics. Blitzkrieg was a fast, coordinated, highly-mobile attack that combined air power and well-armored ground troops along a narrow front in order to quickly breach an enemy’s line. (This tactic was meant to avoid the stalemate that caused trench warfare in WWI.) The Germans attacked with deadly force and precision, seeming unstoppable. In a bid to escape total slaughter, 338,000 British and other Allied troops were evacuated, starting on May 27, 1940, from the coast of France to Great Britain as part of Operation Dynamo (often called the Miracle of Dunkirk). On June 22, 1940, France officially surrendered. It had taken less than three months for the Germans to conquer Western Europe. With France defeated, Hitler turned his sights to Great Britain, intending to conquer it as well in Operation Sea Lion (Unternehmen Seelowe). Before a ground assault was to begin, Hitler ordered the bombing of Great Britain, beginning the Battle of Britain on July 10, 1940. The British, emboldened by Prime Minister Winston Churchill’s morale-building speeches and aided by radar, successfully countered the German air attacks. Hoping to destroy British morale, Germany began bombing not just military targets but also civilian ones as well, including populated cities. These attacks, which began in August 1940, often occurred at night and were known as “the Blitz.” The Blitz strengthened the British resolve. By the fall of 1940, Hitler canceled Operation Sea Lion but continued the Blitz well into 1941. The British had stopped the seemingly unstoppable German advance. But, without help, the British could not hold them off for long. Thus, the British asked U.S. President Franklin D. Roosevelt for help. Although the United States was unwilling to fully enter World War II, Roosevelt agreed to send Great Britain weapons, ammunition, artillery, and other much-needed supplies. The Germans also got help. On September 27, 1940, Germany, Italy, and Japan signed the Tripartite Pact, joining these three countries into the Axis Powers. While the British prepared and waited for an invasion, Germany began to look east. Despite signing the Nazi-Soviet Pact with Soviet leader Joseph Stalin, Hitler had always planned to invade the Soviet Union as part of his plan to gain Lebensraum (“living room”) for the German people. Hitler’s decision to open a second front in World War II is often considered one of his worst. On June 22, 1941, the German army invaded the Soviet Union, in what was called Case Barbarossa (Fall Barbarossa). The Soviets were taken completely by surprise. The German army’s blitzkrieg tactics worked well in the Soviet Union, allowing the Germans to advance quickly. After his initial shock, Stalin rallied his people and ordered a “scorched earth” policy in which Soviet citizens burned their fields and killed their livestock as they fled from the invaders. The scorched-earth policy slowed the Germans for it forced them to rely solely on their supply lines. The Germans had underestimated the vastness of the land and the absoluteness of the Soviet winter. Cold and wet, the German soldiers could barely move and their tanks became stuck in mud and snow. The entire invasion stalled. Hitler sent more than just his army into the Soviet Union; he sent mobile killing squads called Einsatzgruppen. These squads were to search out and kill Jews and other “undesirables” en masse. This killing started out as large groups of Jews being shot and then dumped into pits, such as at Babi Yar. It soon evolved into mobile gas vans. However, these were determined to be too slow at killing, so the Nazis built death camps, created to kill thousands of people a day, such as at Auschwitz, Treblinka, and Sobibor. During World War II, the Nazis created an elaborate, secretive, systematic plan to eradicate Jews from Europe in what is now called the Holocaust. The Nazis also targeted Gypsies, homosexuals, Jehovah Witnesses, the disabled, and all Slavic peoples for slaughter. By the end of the war, the Nazis had killed 11 million people solely based on Nazi racial policies. Germany was not the only country looking to expand. Japan, newly industrialized, was poised for conquest, hoping to take over vast areas in Southeast Asia. Worried that the United States might try to stop them, Japan decided to launch a surprise attack against the United States’ Pacific Fleet in the hopes of keeping the U.S. out of war in the Pacific. On December 7, 1941, Japanese airplanes wreaked havoc on the U.S. naval base at Pearl Harbor, Hawaii. In just two hours, 21 U.S. ships had either been sunk or badly damaged. Shocked and outraged at the unprovoked attack, the United States declared war on Japan the following day. Three days after that, the United States declared war on Germany. The Japanese, aware that the U.S. would probably retaliate for the bombing of Pearl Harbor, preemptively attacked the U.S. naval base in the Philippines on December 8, 1941, destroying many of the U.S. bombers stationed there. Following their air attack with a ground invasion, the battle ended with U.S. surrendering and the deadly Bataan Death March. Without the air strip in the Philippines, the U.S. needed to find a different way to retaliate; they decided upon a bombing raid right into the heart of Japan. On April 18, 1942, 16 B-25 bombers took off from a U.S. aircraft carrier, dropping bombs on Tokyo, Yokohama, and Nagoya. Although the damage inflicted was light, the Doolittle Raid, as it was called, caught the Japanese off guard. However, despite the Doolittle Raid’s limited success, the Japanese were dominating the Pacific War. Just like the Germans seemed impossible to stop in Europe, the Japanese won victory after victory in the early part of the Pacific War, successfully taking the Philippines, Wake Island, Guam, the Dutch East Indies, Hong Kong, Singapore, and Burma. However, things began to change at the Battle of Coral Sea (May 7-8, 1942), when there was a stalemate. Then there was the Battle of Midway (June 4-7, 1942), a major turning point in the Pacific War. According to Japanese war plans, the Battle of Midway was to be a secret attack on the U.S. air base on Midway, ending in a decisive victory for Japan. What Japanese Admiral Isoroku Yamamoto did not know was that the U.S. had successfully broken several Japanese codes, allowing them to decipher secret, coded Japanese messages. Learning ahead of time about the Japanese attack on Midway, the U.S. prepared an ambush. The Japanese lost the battle, losing four of their aircraft carriers and many of their well-trained pilots. No longer did Japan have naval superiority in the Pacific. A number of major battles followed, at Guadalcanal, Saipan, Guam, Leyte Gulf, and then the Philippines. The U.S. won all of these and continued to push the Japanese back to their homeland. Iwo Jima (February 19 to March 26, 1945) was a particularly bloody battle as the Japanese had created underground fortifications that were well camouflaged. The last Japanese-occupied island was Okinawa and Japanese Lieutenant General Mitsuru Ushijima was determined to kill as many Americans as possible before being defeated. The U.S. landed on Okinawa on April 1, 1945, but for five days, the Japanese did not attack. Once the U.S. forces spread out across the island, the Japanese attacked from their hidden, underground fortifications in the southern half of Okinawa. The U.S. fleet was also bombarded by over 1,500 kamikaze pilots, who caused major damage as they flew their planes directly into U.S. ships. After three months of bloody fighting, the U.S. captured Okinawa. Okinawa was the last battle of World War II. In Eastern Europe, it was the Battle of Stalingrad (July 17, 1942 to February 2, 1943) that changed the tide of war. After the German defeat at Stalingrad, the Germans were on the defensive, being pushed back toward Germany by the Soviet army. With the Germans being pushed back in the east, it was time for the British and U.S. forces to attack from the west. In a plan that took a year to organize, the Allied forces launched a surprise, amphibious landing on the beaches of Normandy in northern France on June 6, 1944. The first day of the battle, known as D-Day, was extremely important. If the Allies could not break through the German defenses on the beaches this first day, the Germans would have time to bring in reinforcements, making the invasion at utter failure. Despite many things going awry and an especially bloody fight on the beach codenamed Omaha, the Allies did break through that first day. With the beaches secured, the Allies then brought in two Mulberries, artificial harbors, which allowed them to unload both supplies and additional soldiers for a major offensive on Germany from the west. As the Germans were on the retreat, a number of top German officials wanted to kill Hitler and end the war. Ultimately, the July Plot failed when the bomb that exploded on July 20, 1944 only injured Hitler. Those involved in the assassination attempt were rounded up and killed. Although many in Germany were ready to end World War II, Hitler was not ready to admit defeat. In one, last offensive, the Germans tried to break the Allied line. Using blitzkrieg tactics, the Germans pushed through the Ardennes Forest in Belgium on December 16, 1944. The Allied forces were totally taken by surprise and desperately tried to keep the Germans from breaking through. In so doing, the Allied line began to have a bulge in it, hence the name Battle of the Bulge. Despite this being the bloodiest battle ever fought by American troops, the Allies ultimately won. The Allies wanted to end the war as soon as possible and so they strategically bombed any remaining factories or oil depots left within Germany. However, in February 1944, the Allies began a massive and deadly bombing attack on the German city of Dresden, nearly demolishing the once-beautiful city. The civilian casualty rate was extremely high and many have questioned the reasoning for the firebombing since the city was not a strategic target. By the spring of 1945, the Germans had been pushed back into their own borders on both the east and west. The Germans, who had been fighting for six years, were low on fuel, had barely any food left, and were severely low on ammunition. They were also very low on trained soldiers. Those that were left to defend Germany were the young, old, and wounded. On April 25, 1945, the Soviet army had Berlin, Germany’s capital, completely surrounded. Finally realizing that the end was near, Hitler committed suicide on April 30, 1945. The fighting in Europe officially ended at 11:01 p.m. on May 8, 1945, a day known as V-E Day (Victory in Europe). Despite the victory in Europe, World War II was still not over for the Japanese were still fighting. The death toll in the Pacific was high, especially since Japanese culture forbade surrender. Knowing that the Japanese planned to fight to the death, the United States was extremely concerned about how many U.S. soldiers would die if they invaded Japan. President Harry Truman, who had become president when Roosevelt died on April 12, 1945 (less than a month before the end of WWII in Europe), had a fateful decision to make. Should the U.S. use its new, deadly weapon against Japan in the hopes that it would force Japan to surrender without an actual invasion? Truman decided to try to save U.S. lives. On August 6, 1945, the U.S. dropped an atomic bomb on the Japanese city of Hiroshima and then three days later, dropped another atomic bomb on Nagasaki. The devastation was shocking. Japan surrendered on August 16, 1945, known as V-J Day (Victory over Japan). World War II left the world a different place. It had taken an estimated 40 to 70 million lives and destroyed much of Europe. It brought about the splitting of Germany into East and West and created two major superpowers, the United States and the Soviet Union. These two superpowers, who had tenuously worked together to fight back Nazi Germany, became pitted against each other in what became known as the Cold War. Hoping to prevent a total war from ever happening again, representatives from 50 countries met together in San Francisco and founded the United Nations, officially created on October 24, 1945. 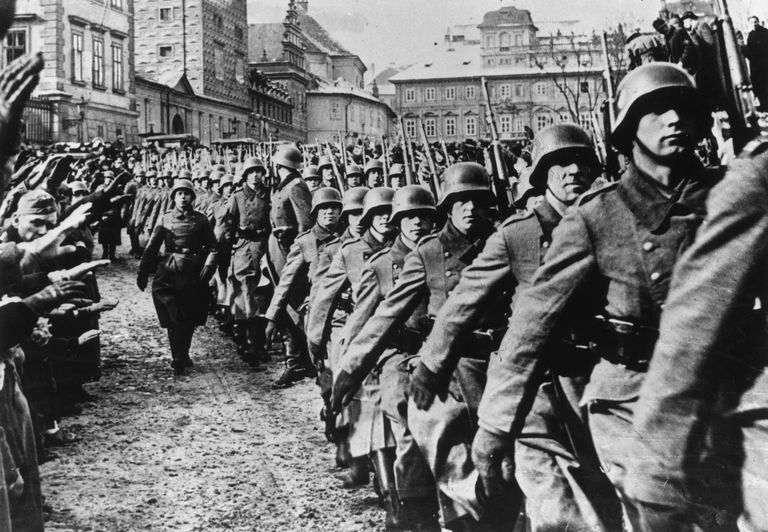 Why Did World War II End Officially on Three Different Dates?